This Numbered Time Card Rack is suitable for the following clocks/cards: Ac001 Ac002 Seiko Clocks, Max Clocks and all cards requiring a pocket depth of 150mm and a width of 86mm. 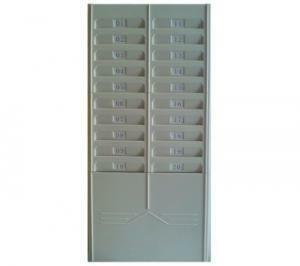 Numbered Card Rack – This Numbered Time Card Rack is suitable for the following clocks/cards: Ac001 Ac002 Seiko Clocks, Max Clocks and all cards requiring a pocket depth of 150mm and a width of 86mm. 20 card capacity.